Save the Homeland doesn't have too many House Extensions. It is kind of like the original Harvest Moon for SNES which had only a couple extensions. Below is a list of the two extensions available in this game. Unlike the other games, these extensions only take one day for the Carpenters to build. The day after you buy the extension, it will be complete in the morning that you wake up. To buy an extension in this game, go to Woody's House and check the list. Below is a description of each. The Dog House is simple a House for your Dog which is located right next to your House. The only requirement that you need is to have a Dog. You must first catch one in the wild and get it to love you. 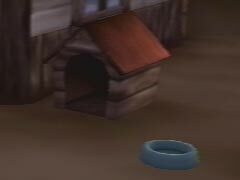 Once you have just simply caught the dog you will be able to buy the Dog House. The Dog House is used for keeping your Dog healthy when it rains out. Instead of you having to bring your dog indoors, you just leave it outside and it will sleep in its Dog House all on its own. 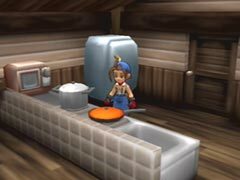 The Kitchen is mainly used for making recipes. To enter your Kitchen there will be a door added to the main room of your house. In the Kitchen is a Refrigerator to store any food items to use for making Recipes. You also can store your Frying Pan, Pot, Oven, etc. There are two other doors in the Kitchen. The one on the right will lead you to the bathroom, whereas the one of the left leads you to washroom. The washroom has a bathtub in it and you use that to help restore some of your stamina that you may have lost during the day. When cooking in the Kitchen, you can use up to three ingredients per recipe. Check out the Recipes page for more information.